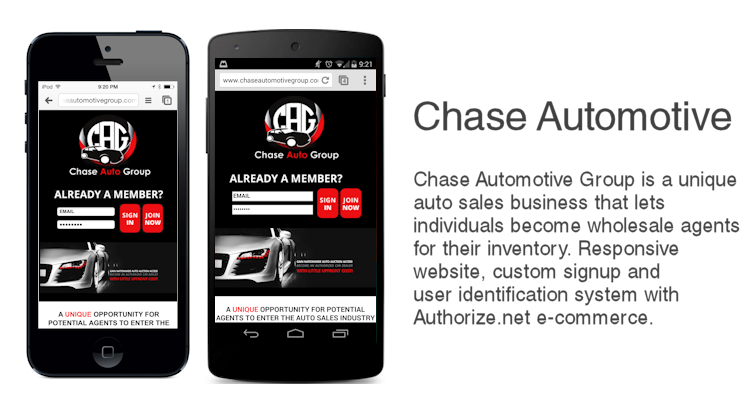 Chase Automotive Group - Digital Wander, Inc.
Chase Automotive Group is a unique automobile business that allows its members to become wholesale auto sales agents. Integrating a custom e-commerce solution using Authorize.net and Wells Fargo, and a way to verify agent applicants through online tools, Digital Wander helped launch another new business model for the progressive entrepreneur! This entry was posted in Android, Android tablet, E-commerce, iPhone/iPad, Web Applications by digitalwander. Bookmark the permalink.